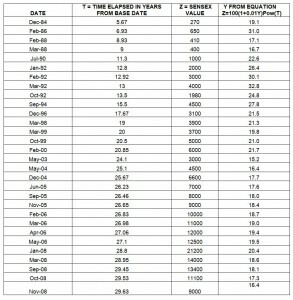 In the write up Fair values of the Sensex corresponding to its intrinsic and true worth were predicted for a fifteen year period beginning April 2009 and ending on April 2024.At the time of the first edition of the write up the two figures corresponding to the start date (April 2009) and end date (April 2024) were determined as 12600 and 79500 respectively. Then in March 2009 the article was updated. Though the first Para remained more or less unaltered, `yours truly` became a little more pessimistic after the 26/11 Mumbai attacks as well as the realization that the impact of the global recession was somewhat deeper than anticipated earlier and reworked and altered the two vital figures to 11100 and 65500. Now this is the end of August 2009 when there is a newfound stability at the centre after the UPA won the elections convincingly and there are signs of the global recession tapering off somewhat, the sensex is travelling within the range 15000 and 16000, and `yours truly` has revised the two figures back to 12600 and 79500. It goes without saying that the first Para in the original write up makes no sense at all. The lifetime opportunity has gone; the sensex is near the top end of even an optimistic range and on the verge of getting out of this range into an irrational zone. The insiders are making their plans ready to fleece the outsiders once again. Now the first Para needs to be reshaped and instead of saying `There is no cause for panic`, I should be saying `There is no cause for Euphoria’. But I am wiser now so I begin the article with a more generalized approach so that whatever happens I don`t have to revise the opening Para time and again in subsequent editions. Even if one enters the market at the highest of the Optimistic range, and after 10 years exits at the lowest of the Pessimistic range the expected annual compounded return is about 6.0%.On the other hand if one enters at the lowest of the Pessimistic range and after 10 years exits at the highest of the Optimistic range the expected annual compounded return is 21.4%.The corresponding values for a 15 year period of investment are 7.5% (Minimum) and 18.5% (Maximum) and those for a 5 year period of investment are 0.5% (Minimum) and 29.2% (Maximum). The investment however has to be a long term one and should be in the Sensex group of shares preferably in proportion to their respective weightages.If you are a little bit smarter, then you’ll know that within this group there are a few companies (about half a dozen) which give a distinctly higher return than the average of the sensex group. For short term investments and for investments in shares other than those belonging to the sensex group one has to be extra smart, knowledgeable, resourceful and above all very lucky. Sometimes the Sensex goes beyond the optimistic range (Let’s call it period `O`), and sometimes below the pessimistic range ( period `P`).Such periods are rare and short lived when insiders and speculators are in full command, they are smart people ready and alert to take advantage of the common man who is caught in the euphoria of the boom time and buys during time `O`, or is caught in a Panic stage and sells during time `P`.Some financial experts contribute towards these irrational movements by making short term predictions after factoring in the anticipated speculation activities while formulating their opinions without actually revealing these aspects in their reasoning. Period `O` has been experienced a number of times in the past, notably the 1992 and 2000 scams and the 6 months ending mid January 2008.Period `P`has been experienced only a few times in the last 30 years, viz during May 2003 when the sensex came down to about 3000 compared to its earlier peak of about 6000, and on a few occasions in the recent past, notably during October/November 2008 and March 2009 when it went below the 9000 mark. The purpose of this article is to safeguard the outsiders (retail investors) from the insiders by making these inputs and charts readily available to them at all times, along with the understanding that the index will invariably return to the fair range. Investors should know precisely when to exercise caution and when to avoid panic. Financial experts and Investment advisers who care for their clients should analyze and prepare their own charts and update the values each time there occurs an event of consequence, but this adjustment in the values should be done only to the appropriate extent which is commensurate with the magnitude of the event`s impact. The analysis is based on a factor called `Y-Factor`(where `Y` is simply the Return On Investment, ie the percentage annualized appreciation of the sensex compounded every 12 months) whose values are first determined according to the movement of the sensex over the last 30 years based on available data and then predicted for the next 15 years based on the assumption that the broad trend established will continue in the same manner with suitable adjustments after factoring in the recent events as well as the broad parameters that might govern the future trend. Let `A` be the base value of the sensex which is 100 on the base date which is taken as 1st April 1979. Let `T` be the time elapsed in years since the base date to the time at which theY factor is determined. Let `A1` be the value of the sensex at the time of measurement (i.e. T years after the base date). 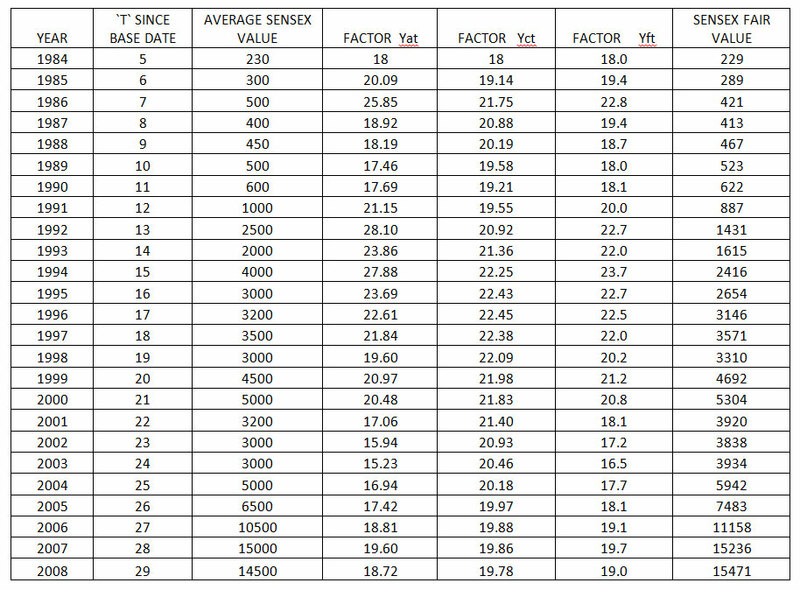 Values of the factor `Y` have been worked out for about 30 different dates selected at random based on Sensex values and time elapsed as on these dates, these are indicated in Table – 1 ( see Appendix A – 01 ) and will give some idea as to how this factor has progressed. As can be seen from this Table the lowest recorded value of `Y`was 15.2 during May 2003.If in the recent bear phase this record was to be broken the sensex would have had to go down below 6540 mark. 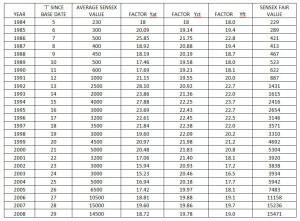 All calculations are done on EXCEL and shown in Table – 2 (see Appendix A-02 ). For example Yc7 =(Ya7*7 +Yc6*6 +Yc5*5)/6*3. This column thus indicates how the sensex would have run its course had there been no scams, no speculators, no insiders, no bulls, and no bears etc.Thus we see from Table 2, the journey of the Fair value Y Factor of the sensex during which it attained a peak of 23.7 in 1994 and a low of 16.5 in 2003 finally ending at 19.0 on April 2008. This was comparatively the easier part of the analysis where the element of intuition was not very high and recorded figures of the past were made use of. Next comes the daunting task of arriving at the most appropriate value of `Y` corresponding to the fair value of the Sensex as on 01-04-2009 and the anticipated value towards which it will tend to approach 15 years later ie on 01-04-2024.In short we need to find out the two crucial values viz `Yf30` and `Yf45`, based on which the Sensex values ( Fair,Pessimistic,and optimistic) for the next 15 years will be determined. Forecasting the future can be a tricky business. There are no mathematical formulas available. Factors and parameters that need to be considered are far too many, Uncertainties are enormous; events of the future, many of which may have far reaching significance are unknown today. The problem is uncommonly complex. A holistic approach packed with intuitions will be followed. Even the greatest of financial experts will do it no other way. Sometimes a layman is better off if he takes the average view of the experts. However we need to differentiate the good experts from the not so good. This should not be difficult. You don`t have to be a good batsman to know who is a good batsman. Not all experts however are confused. In fact there are some (let’s call them E1) who are extra smart for they even take into their calculations the likely acts of speculation thus improving the probability that their prediction will come true. Then there are the confused ones (E2) who tend to play safe by predicting that the prevailing trend will continue. This is akin to forecasting the next day`s weather by simply saying that it will be nearly the same as today`s, for which prediction there is a 77 percent probability of coming true. They will continue to impress with their predictions until the U-turn stage…when the levels reached are no longer sustainable, at which stage they will be proved horribly wrong. 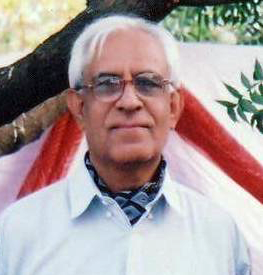 The same experts who in January 2008, when the index was at the 20000 level had no hesitation in predicting that 25000 was very much on the cards – despite the fact that triggers for the global economic recession were already felt, later in March 2009 when the sensex was hovering near the 8500 level, confidently predicted still lower levels despite the realization that the impact of the US recession on the Indian economy was not commensurate with the 60 percent decline in the index from its previous peak. In the process many investors suffered to such an extent that they lost complete faith in the stock markets and were not emotionally in a proper frame of mind to reenter even at low levels. Perhaps they may be tempted again when its too late. There are of course some genuine experts (E3) who give honest and sincere views on where the market stands in relation to where it should be.The trouble is that the market invariably goes far outside the fair range for the simple reason that there is an abundance of category E1 and E2 experts and an acute shortage of category E3. “If ten of the World`s greatest and most competent Financial wizards were asked to forecast the value of the fair value Y Factor Yf45 as on 01-04-2024 and if these values as determined by the ten experts vary between `A` and `B`, then it can be said with some confidence and conviction that – considering the nature and magnitude of the uncertainties of the future and the enormous complexities involved in assessing the impact of future events and notwithstanding the holistic approach, packed with intuitions, and crude methodology applied in the analysis – the probability is reasonably high that the corresponding value as worked out by `yours truly` will be within that range rather than outside it“. We now proceed with the rest of the analysis. The first part which involves determination of two crucial factors ie Yf30 and YF45 and done in a single page and shown in table below is simply listing out the important factors and their likely impact (+) or ( -) in changing the Y factor. 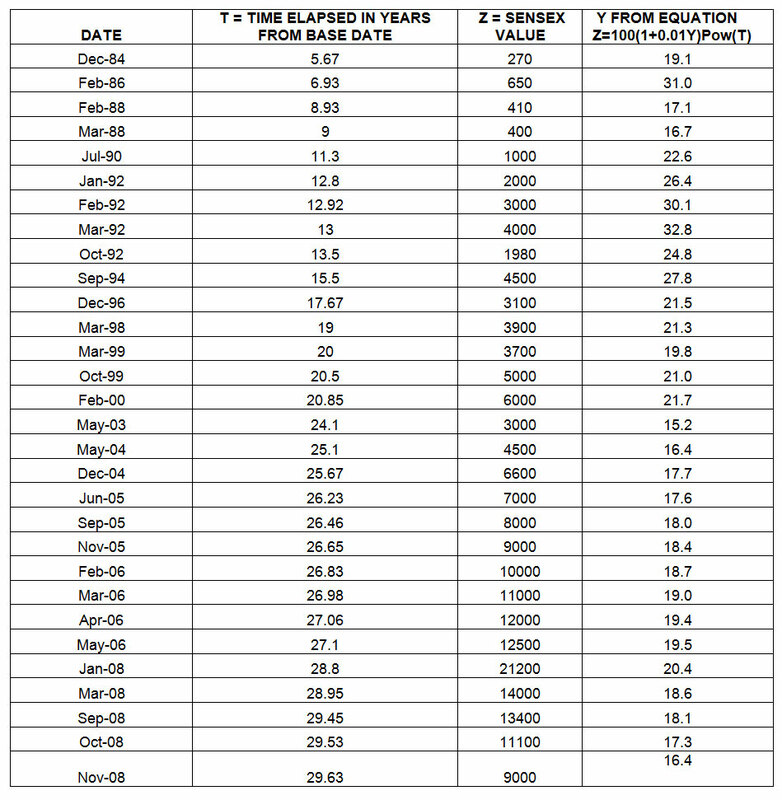 Observe progress of Yft from 1989 to 2008 in table 2 (last column) and try to correlate the significant events that may have impacted the sensex.We all know the opening up of the Indian economy and the landmark budget of Dr Manmohan Singh in 1991.This might have been good enough to raise Yft by 2.5 points over a period of time but the entire rise took place in just a couple of years (via the 1992 scam).Later acts of positive impacts over the years such as financial reforms, disinvestment, Dream budget of 1997, etc etc could not raise Yft any further which was absorbed and discounted in the initial rise.Now we cannot say that in any particular year in the future a path breaking budget will be presented. Instead all these aspects can be covered under the heading “Indian growth story or the India shining factor“.Indian economy is considered among the emerging fast growing economies of the world. It still has a long way to go before it catches up with the leading nations and so has an enormous potential for development. A positive impact of 1.5 points in this category is not unjustified. Factors such as the demolition of Babri Masjid,communal riots, Kargil war, Acts of terrorism etc may have impacted negatively by about 1.5 points of which 0.5 points could be attributed to 26/11 Mumbai attacks. These aspects can be taken under the heading “Relations with Pakistan“.If an index of 1.0 is assigned towards perfectly good relations between India and Pakistan, it can be considered that this relationship index varied between 0.25 and 0.5 in the past. Perhaps today it stands at 0.3, which is just above the lowest. Currently it looks as if this will improve as both countries have realized the foolishness of confrontation. But control over terrorism may not be achieved soon and so a negative impact of 1.0 for the future is considered in this category. The global economic slowdown`s impact on the Indian stock market was far more pronounced than expected and was not at all commensurate with the extent to which the Indian economy was implicated. The fall in the Sensex from 21400 (January 2008) to about 8000 in less than a year corresponds to a fall in `Y`from 20.5 to 16.0 ie by about 4.5 points. More than two thirds of this can be attributed to `irrational behavior’. For quite some time before the impact of the slowdown, the sensex was beyond the optimistic range and then the shear momentum of its fall carried it to below the Pessimistic range.An overall impact of ( – ) 3.0 is considered appropriate for this category. Out of this 50 % ie ( -) 1.5 can be taken as already absorbed and discounted in the current fair value and the remaining ( – ) 1.5 attributed to the future to take care of the balance uncertainties of the current slowdown and the probabilities of similar recessions in the future. This is an enormously complex problem. The trouble is that a certain 7 % of the world`s population (the richest) generates 50 % of the world`s Green house gases, and a certain 50% of the population generates just 7% of GHGs.It is this fact that makes the solution of the problem extremely complex in as much as the targets and time frames for reducing emissions by countries need to be commensurate with the quantum of their existing per capita emissions rather than total emissions. But the overall targets for reducing emissions to a certain acceptable level in a certain time frame say by 2050 cannot be met in this way, and so the only way out is that country `x` will have to pay the carbon price for its old excessive emissions to a country `y` for reducing its future emissions to an unfairly low level. Indeed the mathematics is complicating and the solutions which are acceptable to all concerned are not easy to find. Needless to say that perfect solutions will not be forthcoming unless there is a global approach, global understanding and global cooperation. For countries like India where removal of poverty is still a more pressing issue, and per capita emissions are less than in developed countries (Though the total quantum of emissions are substantial ) targets for reducing emissions may not be so stringent at present, and adaptation rather than mitigation seems to be their approach to the problem. Though it may be some years before direct impact is felt in India, ten years from now it will become imperative and unavoidable for India to address these problems in a scientific manner and it goes without saying that resolution of these issues will be at the cost of recession in some sectors like Auto & Power sectors at first and consequently several other sectors in course of time whereas some sectors may even benefit such as IT Sector. A negative impact of 2.5 is considered in this category. Continued advances in technology is one of the most dominant factors in stimulating growth and development worldwide over the last hundred years and continues to do so. There is no knowing what surprises are in store for us. Who knows there may be some technological breakthroughs to address issues such as global warming or depletion of resources? Computing power is forever increasing; Moore’s law which states that computing power is doubling every eighteen months is still going strong, though it may not last for many more years, it is possible after a gap of several years there may be a sudden jump in computing power when Quantum computation is made possible practically. A positive impact of 1.0 is considered in this category. A comfortable majority for the UPA augers well for the future, at least for the next 5 years and a positive impact of 0.5 points is considered in the fair value Yf30 itself. However in the long term a negative impact of 0.5 is taken in this category, as it appears that some political parties having negative ideologies may persist with these ideologies, such as BJP with its non secular approach, and the Left parties with their Anti West approach. The negative impact could have been more but for the fact that the former(BJP) tends to be somewhat less non secular when in power and the latter (the Left) has scant probability of ever attaining enough numbers to cause concern. Can spur India`s growth even further, improve energy security, enhance India`s status in the world in the context of overall non proliferation. Positive impact considered 0.5. From the overall impact of all the factors listed in the table above it can be inferred that `Yf30` as on 01-04-2009 was 1.5 points less than Yf29 worked out earlier as 19.0 and and will further reduce uniformly by another 1.5 points by 01-04-2024.Thus Yf30 is taken as 17.5 and Yf45 as 16.0 Predicted values of the Sensex for the next 15 years are worked out in the following manner and shown in Table 3 (refer Appendix A-03). From equation 1 Fair values of the Sensex on 01-04-2009 and 01-04-2024 are worked out as 12622 and 79544 respectively based on `Yf30` as 17.5 and Yf45 as 16.0 Fair values during the intervening period are worked out at yearly intervals on the assumption that the `Yf“ factor reduces progressively from 17.5 as on 1st April 2009 to 16.0 as on 1st April 2024.Fair value range is determined as varying from a value which is the average of the fair and pessimistic values to a value which is the average of the fair and optimistic values. Likewise the optimistic values are determined by simply increasing the `Y` factor by 0.75 percentage point and are worked out as 15277 as on 01-04-2009,and 106307 as on 01-04-2024,and the intervening values as well as the range worked out in the manner as shown above. The optimistic range has its lower value same us upper value of the fair range and the difference between this value and the optimistic value is added to the optimistic value to get the upper value of the optimistic range. Suppose `A` wants to invest in October 2010 when the sensex is 17000 on the day of his investment and he decides to remain invested till April 2022. Minimum ROI = ( ( 40452/17000)^(I/11.5) -1)*100 = 7.8 percent. Maximum ROI = ((94092/17000)^(1/11.5) – 1)*100 = 16.0 percent. For `A` to be still a loser after remaining invested for 10 years,Yf45 must go down to 13.8 which is similar to expecting today`s sensex going below the 5000 mark and staying there for a substantial length of time. By no means is this an impossible situation. Nuclear war is always a distinct possibility. However if that happens there may be other pressing life and death issues to be confronted with, and winning and losing at the stock exchange may have hardly any relevance. aspirding writers? I’m hօping tto start my οown blօg sоon Ьut ӏ’m a little lost oon everything. go for a paid option? Thwre are so mɑny cchoices oսut there that I’m totally confused ..
Also, The contents are masterwork. you’ve done a great task on this topic! Great blog you’ve got here.. It’s difficult to find excellent writing like yours these days.